As we brace for another series of Pay Commission-mandated salary hikes, the question is if it is the best use of government resources. As public servants get ready to enjoy the New Year’s blessing that the Seventh Pay Commission is expected to bestow, it may be a time for the rest of us to look this gift horse in the mouth. The Fourteenth Finance Commission estimates the cost of the Sixth Pay Commission at over Rs. 90,000 crore annually, since pay and allowances of Union government employees more than doubled between 2007-08 and 2011-12. Compare this to the estimates in the economic survey for the year 2011-12, about Rs. 70,000 crore each for food subsidy, fertilizer and petroleum subsidy and less than Rs. 40,000 crore for the Mahatma Gandhi National Rural Employment Guarantee Act. Simply put, the additional Central government expenditure due to the implementation of the Sixth Pay Commission was over 40 per cent of the major subsidies. If we take into account the costs to the State governments, the tab for Sixth Pay Commission largesse is probably equivalent to all the subsidies provided by the Central government. As we brace for another Pay Commission-mandated salary hike, the question to ask is not whether the government can afford it but if it is the best use of government resources. Government employees receive Dearness Allowance (DA) annually to compensate for inflation; they also receive an annual performance appraisal for promotions, which brings with it salary increases. So the decadal salary increases under the Central Pay Commission (CPC) are meant to address inequities in salaries across different parts of the government, across ranks as well as between the public sector and private sector. It is the latter that has provided the greatest justification for salary increases granted under CPC in the past. Dizzying salary packages reported for new Indian Institute of Management graduates or Indian Institute of Technology graduates funnel a sense of discontent among public sector employees since it is hard to imagine any 25-year-old government servant receiving a package of Rs. 40 lakh per annum. This smoke and mirrors strategy masks several observations made by the Sixth Pay Commission. First, it noted that the contention of vast disparities between private sector and government employees was not borne out by data. The CPC found that compensation to Group C and D employees in government was higher than that in the private sector; for Group B it was similar and only for Group A was it lower. Group A employees form less than 5 per cent of the total Central government workforce; Group C and D are about 90 per cent. Second, it noted that a government job offers many other benefits not available in the private sector and the fear of flight away from public service towards the private sector is overblown. In spite of these observations, the ultimate recommendations of the Sixth CPC led to substantial increases in the salary and allowance of all public servants, first in the Central service and later on in State governments. A comparison of incomes between private sector employees and government employees using data from India Human Development Surveys (IHDS) of 2004-05 and 2011-12 is instructive in understanding the consequences of the last CPC. These surveys of over 40,000 households were jointly organised by the National Council of Applied Economic Research and the University of Maryland. The graphic shows monthly salaries for men aged 25-59 in 2011-12. Many women work part time as anganwadi workers and ASHA workers and hence are excluded from this comparison, but their inclusion will not change the fundamental results. 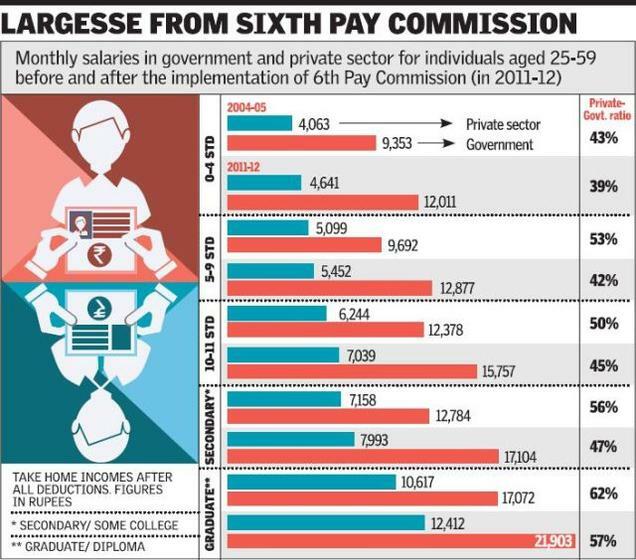 The results show that at every single level of education, government workers are paid more than private sector workers and more importantly, the public service advantage has increased rather than decreased after the implementation of the Sixth Pay Commission recommendations. A driver in government service earns far more than one in private service, but so does an engineer. This comparison does not include the other benefits government service provides including PF contributions, housing benefits, health insurance and, frequently, admission of children to coveted Kendriya Vidyalayas. One might say that the problem is not global but is concentrated in highly skilled positions. Individuals who are highly skilled may be more likely to choose the private sector. Here only the Union Public Service Commission can tell us if the qualification of the entering cohort of the Indian Administrative Service officers is declining, but at a slightly lower stratospheric level, we see no such evidence. The IHDS shows that among college graduates with a first class degree, government service still seems to be preferred. In 2004-05, among the male college graduates employed in public service, 37 per cent had a first division; this proportion had increased to 39 per cent by 2011-12. This is not to say that skill upgradation is not taking place in the private sector, where the proportion of first class degree holders among graduates has increased from 28 per cent to 35 per cent, but these figures do not suggest that government services are suffering on an average; just that the more qualified individuals are seeking salaried work and moving away from farming and small businesses benefitting both government service and the private sector. That salary increases will be bestowed by the Seventh CPC is a given. Whether it will address the real challenge, lower wages for Group A officers compared to the private sector, and recognise the public service advantage for the rest of the employees remains questionable. Let us hope that the Seventh CPC will address the challenge of government salaries with a scalpel rather than an axe. in 7th pay commission govt,may increase 30 to 40% hike but that is not use full for employees unless income tax range increases..In my opinion real tax payers are govt.employees only.If in 7 th pay commission how much he increases it is not benifit to any employee.